In the heart of Nahalat Benyamin, an ice cream shops has its door open until 11 at night. 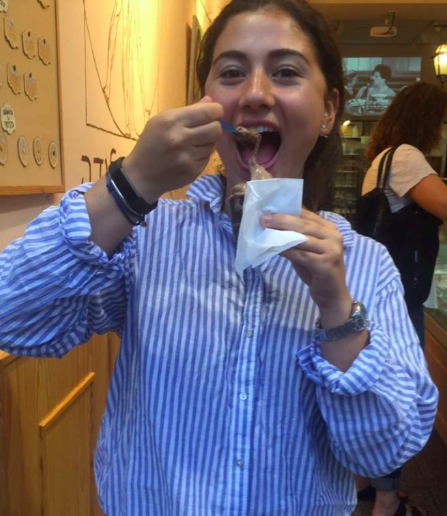 After a hot long day in Israel, it is necessary to get a scoop of icy cold chocolate ice cream, or any other flavours of course. What I like most about this place is the many vegan ice cream options they have, such as hazelnut, pistachio, chocolate cinnamon, almond and many more. Couldn’t resist taking all these pictures, I mean, look how reviving these looks? The shop is not that big, which makes it perfect for sitting down in a quiet space after a busy day. If you’re not already too hot, then sitting outside is probably better so you can look at the people walking by next to the Shuk. I love ice cream so much, I truly think it is what you need to make your day a little better. Everywhere I go, ice cream is something I usually get. This place however is really one I will come back to whenever I’m in Tel Aviv! Why not stop and get a scoop of dark chocolate on my way to the beach? As you can see in the picture below, ice cream makes me quite happy! I’d love to know about all of your favourite ice cream flavours so don’t forget to comment below! Next Next post: They Say Shakes Bring all the Boys to the Yard!